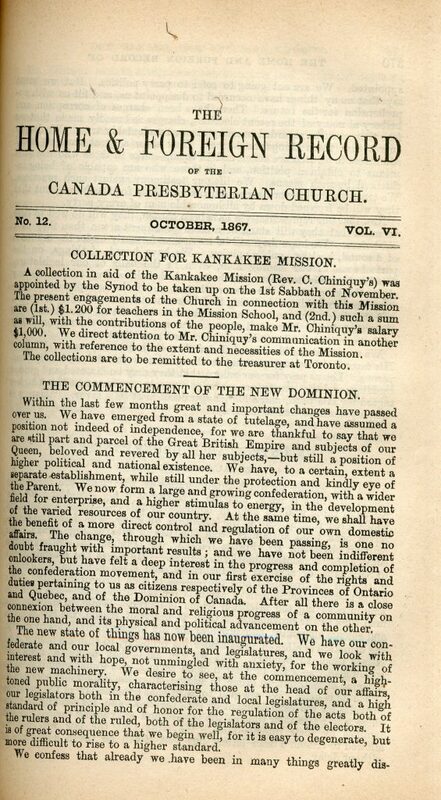 The various branches of Presbyterian churches in Canada were taking steps to bring about closer relations by 1867. The Presbyterian Church of Canada in connection with the Church of Scotland appointed a delegation to attend the Synods of Nova Scotia and Prince Edward Island as well as New Brunswick to discuss their interest in more cooperation between the churches, as well as the possibility of consolidation. The 1867 Synod of New Brunswick in connection with the Church of Scotland was attended by delegations from the Synod of Nova Scotia and Prince Edward Island in connection with the Church of Scotland and from the Presbyterian Church of Canada in connection with the Church of Scotland. Taking into account the words from both delegations, the Synod of New Brunswick decided to form a union with the Synod of Nova Scotia and Prince Edward Island. This union occurred in 1868, creating the Synod of the Presbyterian Church of the Maritime Provinces in connection with the Church of Scotland. The Canada Presbyterian Church was also beginning to consider closer relations with the Presbyterian Church of the Lower Provinces. At the 1867 Synod meeting a delegation was selected to attend the sister church’s synod. Though no other unions would take place until the major union in 1875 that resulted in the Presbyterian Church in Canada, the roots of closer relations between the churches were growing in 1867.